A Coach Admin can change and update any of the account information for any of the users in the groups that have been given access to on the Administration Site. This means they can change passwords and/or details of coaches and players that they manage. However, some users in the Groups they administer may have access to sensitive or confidential medical information and their account information needs to be locked to a Coach Administrator. To ensure data protection for users accounts who can access sensitive information, a Site Administrator can set Role/s to be locked and no users in this role can have their account edited by a Coach Admin. 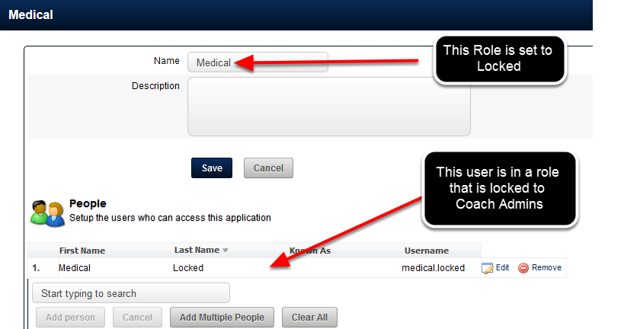 Administrators can set up users in a Role/s not to have their account details editable by Coach Administrators. The Admin Locks Module is only available on Site Administrators Accounts. Name the Admin Lock, add in a Description and click on "Save"
You can add in Multiple Roles at once using the "Add Multiple Roles"
Click on Add Multiple to add in multiple roles at once. 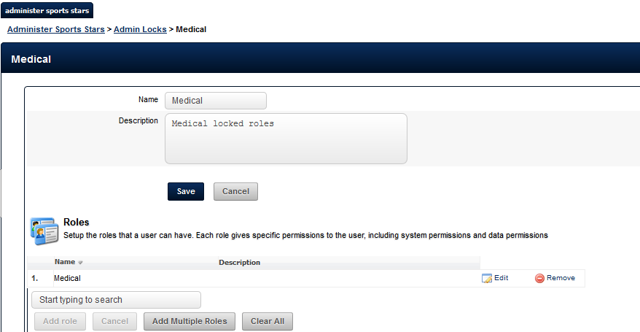 Remember, a Team Admin cannot edit any of the account details, so make sure you apply the correct roles for locking. You do not want a Coach Admin to be an Administrator of a Role that is locked, or they could remove a user from this Role and then their account details could be editable. No Coach Admins should be set for Locked Roles. Double check this to ensure optimal data protection practices. The Medical user is in a role that is Locked. The Coach Admin can see the user in the Groups they Administer. The Coach Admin can view this users account details, but they cannot EDIT this users account information (as shown in the image in the step below). 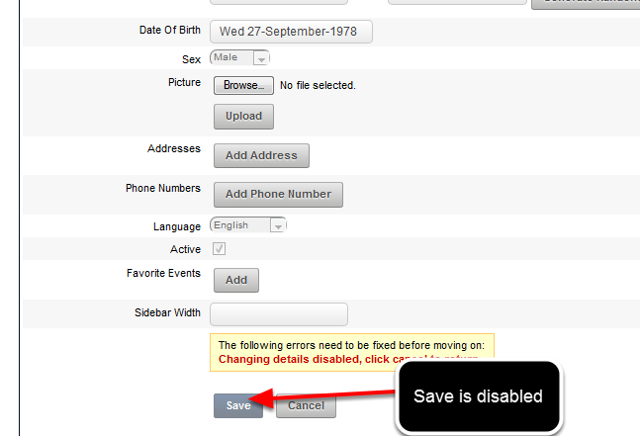 The Save button is disabled, so no changes can be made to usernames, passwords etc for this user. 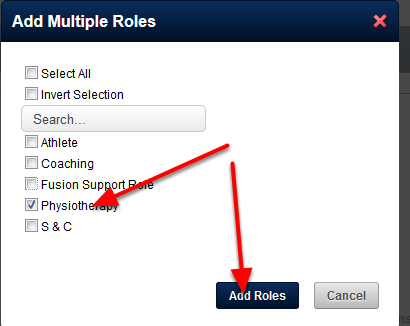 A Coach Admin can only add or remove this user to or from the Roles and/or Groups that they have Administrator rights for.